eMule is a P2P application which means that many other users will want to connect to your eMule to upload or download files. For this purpose eMule opens two ports on which it listens for incomming connections or packets. If you do not use a router, personal firewall or anything like this there will be most likely no problem and all incoming packets will reach eMule, which means that your get a "High ID" (and/or the "Open" status) and the Porttest will tell your that everything is fine. If you do use a router, firewall, etc and get a "Low ID" or "Firewalled" status and the porttest tells you that your eMule is not reachable, you should configure your router / firewall so that it allows incoming packets to reach eMule. Please note that eMule does work with a "LowID" too, but you will have several disadvantages like slower downloads, because others cannot easily connect to you. Since Version 0.48a eMule supports UPnP (Universal Plug and Play) which helps to easily configure routers and firewalls which support it. If eMule is able to setup the needed port forwardings with UPnP on your router, you don't need to care about port forwardings any further, because eMule will do all the work for you. 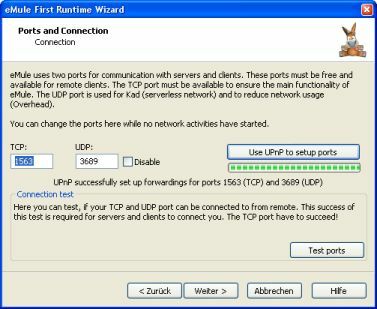 To test if UPnP is available on your system, go to the connection page of the First Runtime Wizzard (you can restart it with "Tools" => "eMule First Runtime Wizzard") and click the "Use UPnP to setup ports" button. eMule will now test UPnP and tell you if it succeeded or failed. In case it failed, read the next section to learn how to set up the port forwardings manually, otherwise you should be finished here. You can enable or disable UPnP anytime later in the Options => Connections Dialog. eMule listens on two ports, which are randomly selected on the first start since version 0.47c (earlier version used the portnumbers 4662 and 4672 by default). You can see which ports your eMule has preselected in the Options menu (see image below). You also can change those ports if you want to for some reason, eMule is happy with any portnumber. Name / Service Name: This is just a name for the rule you can set to whatever you want. I suggest you use "eMule_TCP"
Protocol / Transport Type: Select "TCP"
Private / Internal IP: Enter the IP which your PC has in your local LAN (for example 192.168.1.1). Not needed for Personal Firewalls. Name / Service Name: This is just a name for the rule you can set to whatever you want. I suggest you use "eMule_UDP"
Protocol / Transport Type: Select "UDP"
After adding those rules to your firewall and / or router eMule should be able to receive incoming connection and therefore get a "High ID". You can confirm that everything works as intended by clicking the "Test ports" button. If you still have problems or did not understand any part if this guide, you might want to try to find help in our forum. Please do read the guides and helps on this topic first however, since this is a very common problem. Name / Service Name: This is just a name for the rule you can set to whatever you want. I suggest you use "eMule_Webinterface"
In very rare cases there might be another port to open: If your router / firewall does not supports stateful UDP connections (which means that it will accept answers to UDP packets you send), you will have to open a port for the UDP answer packets from servers. This is not needed in most cases because nearly all routers and firewall do support UDP answerpackets and even if you are one of the cases where this does not apply, you will not notice much of it except that sources for rare files are found a bit slower and Global Server Searches do not work. To fix this, you will first have to select a fixed port by inserting "ServerUDPPort=[YourPort]" into the "eMule" section of the preferences.ini and the open this port in your router / firewall for incoming UDP traffic.